If you're a B2B marketer you know that generating more visits and leads from SEO and other inbound marketing efforts makes sense for your business. After all those leads cost less and convert to sales at a higher rate than many traditional outbound leads. 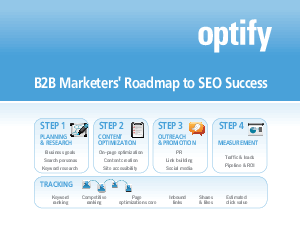 But isn't the road to SEO success long and windy, marred by potholes and dead-end turns? Don't I need to be an SEO guru to figure this stuff out? Worry not. With the right roadmap, resources and tools professional B2B marketers just like you can master SEO and drive a sustainable flow of high-value inbound leads.